Why would you waste one of your free comic choices on CONDENSED reprints? I'll be at my store for the Plasma Freeze prerelease anyway, so will do! Nah! You'd still have to pay me to take them. @Rockman Craze, or rather Professor Megaman under a different name: Could you please stop commenting on things you dislike and have no intention of changing your mind on? It's like you're baiting people who enjoy the comic. On-topic, I'm not counting on The Deep having a copy of this since they didn't have the last FCBD Megaman offering, but it would be nice if they did. Wow. The only things worth less than toilet paper. 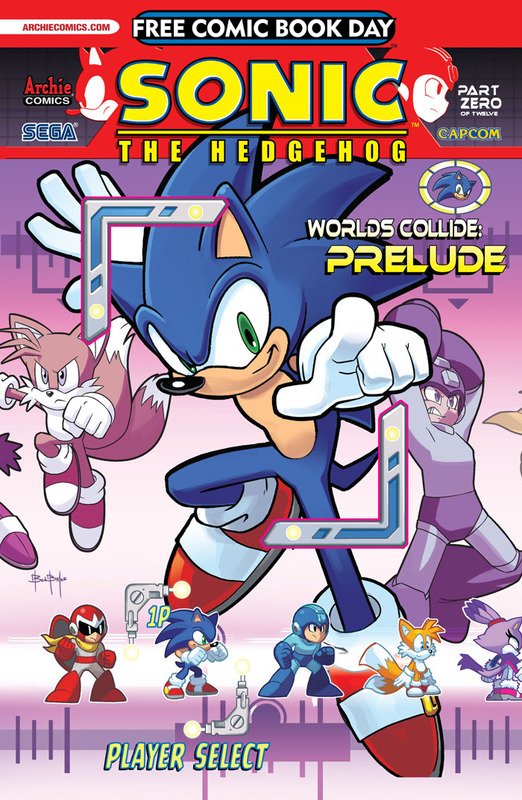 It won't be long before Archie will be giving away all their Megaman/Sonic comics. @Prof. Megaman (again? ): Just shut up already. No one cares. The fact that he's desperate enough to post under different aliases just shows what a troll he is. Ignore him, let him spew his nonsense. It's not like he's persuasive. @Prof. Megaman: Dude, what are you talking about? Toilet paper is expensive nowadays. I know this is a crazy concept for you people to understand but maybe, JUST MAYBE more than one person doesn't like Ian's work on Mega Man? Nope. Everyone who ever hated anything they like are, in actuality, one single entity who exists exclusively to torment them by bashing their tastes. I know RockmanCraze from DeviantArt and I did link a few of my Flynn-bashing posts to him, so maybe I'm partially to blame for him being here. I hope so, I love the idea of rallying people who oppose the decline of quality to a cause. Makes me feel like MLK Jr.
@Prof. Megaman: ...in my defense, I'd seen an actual sockpuppet case that was similar to the above. On another note, you have the gall to compare yourself to MLK Jr. when all you're doing is shitting all over conversations about something you don't like (the more uncalled for, the "better", apparently). It's one thing to criticize something, and another to be an obnoxious jerk who thinks he's comparable to a major civil rights icon. I know I should ignore you, but you're really going out of your way to be loathsome. I yearn for improvement, and without becoming a majority shareholder in Archie Publications Inc. I can only raise the voice of dissent as loud as possible. If I simply shut my mouth and let things go as they are, they'll only continue to get worse because those who stand to profit are constantly testing the public's tolerance of ever-declining quality. 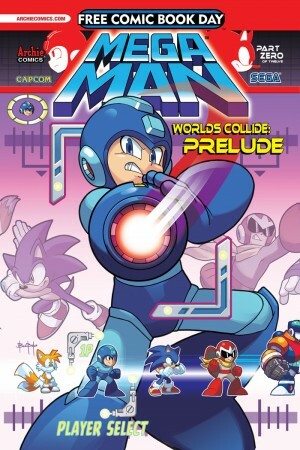 As a Megaman fan, I wish that the comic was pleasing to more than just die-hard adolescents with Asperger's Syndrome. Surely you must know what it's like to be teased with the prospect of a potentially great Megaman product only to end up feeling excluded and somewhat swindled. I was pretty bummed to find my local comic shop hadn't ordered this particular comic. Say what you will about the quality (I enjoy it but I can sympathize with those that think it could be better) but the cover for this free comic is absolutely worth picking it up. 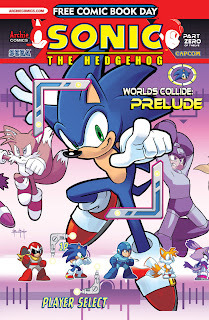 It's my humble opinion that Ben Bates is the best thing (artistically) going for the Mega Man/Sonic comics. I know people rave about Spaz (and he's great, don't mistake me) but Ben's got the geometry and feel down pat and can do some pretty sick compositions and backgrounds to boot. So, yeah, that's my Ben Bates raving to throw in the ring. @Prof. Megaman: No. No, you really aren't. Trying to improve the perceived quality of a comic book is hardly the same thing as getting recognition of the rights for an entire branch of humanity, and to even THINK otherwise does not reflect well on you. I can think of far better ways to improve on something than "chase away everyone who enjoys it and hope that the writer will be short-sighted enough to cater exclusively to the preferences of one or two guys". Like maybe track down the forum and make a post detailing what you think could be changed for the better. Ian DOES listen to constructive criticism, and if you bring up anything valid he'll take that into consideration. With any luck, this will be the last time I respond to you here.